After fussing with this pastel painting for a bit too long, I decided it was time to just go ahead and post it. 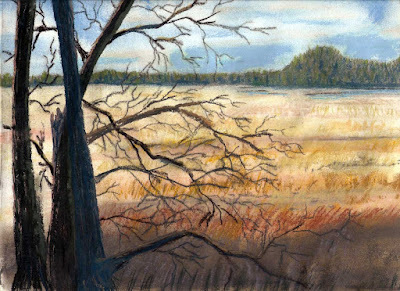 This is a 9x12 pastel study of the Sand Lake estuary with the Sandlake peninsula and recreation area seen in the distance. I'm reading: Sand Lake Pastel StudyTweet this! I happened to stumble across your blog and found myself completely speechless after looking through some of your artwork. Thank you, Kelli. Your comment is my inspiration.